The preseason has officially come to an end and Week 1 is nearing kickoff. Before we get started on previewing the open week of 2018 fantasy football action, we’re taking one quick run through all the divisions with some last-minute fantasy quick hits. We’ll offer up a fantasy value, bust, and sleeper along with some rookies to know and dynasty quick takes for each team. In this edition, we examine the NFC North. The Bears hired offensive-minded head coach Matt Nagy, an Andy Reid disciple, and were aggressive in adding key skill players in both free agency and the draft. Wide receiver Allen Robinson and tight end Trey Burton are nice upgrades and rookie Anthony Miller give second-year quarterback Mitchell Trubisky a ton of talented options. Expect Nagy to force the issue down the field early and often this season in Chicago. Best fantasy value: Jordan Howard and Tarik Cohen, RBs — The Bears’ offense offers a ton of value this year, but especially in the backfield where Howard has top-10 upside and Cohen could emerge as a top-25 PPR back. Fantasy bust: Taylor Gabriel, WR — Chicago gave Gabriel $14 million in guaranteed money. He flashed for the Falcons in their Super Bowl run two years ago but doesn’t offer enough consistency to count on in most fantasy formats. Sleeper to watch: Trey Burton, TE — The former Eagles backup will get a chance to start now and expect him to take full advantage of it. He performed well when Zach Ertz was out in 2017. Rookie(s) to know: Anthony Miller, WR — Few players drew more buzz during training camp around the league like Miller did in Chicago and he should be the team’s No. 3 wide receiver in three-receiver sets. 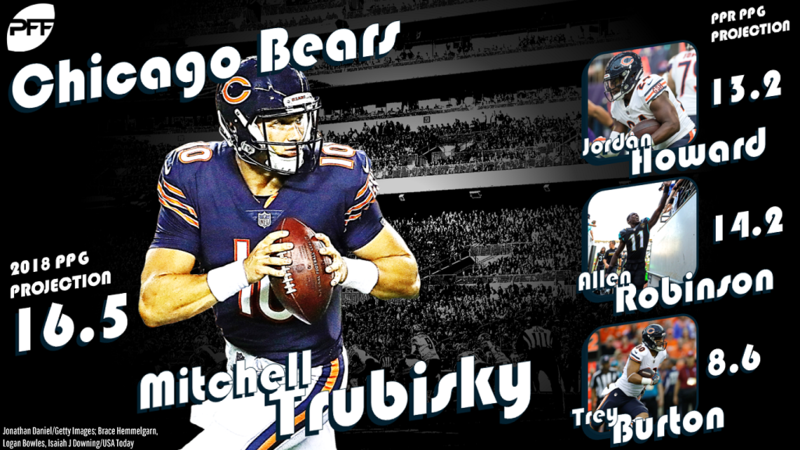 Best current player for their 2020 roster: Mitchell Trubisky, QB — With a huge upgrade at head coach and some improved, young players at the skilled positions in the fold Trubisky’s dynasty stock is rising quickly. After finishing 9-7 and missing the playoffs, Detroit fired Jim Caldwell and brought in former Patriots defensive coordinator Matt Patricia. He opted to retain offensive coordinator Jim Bob Cooter; that’s good for Matthew Stafford and his favorite targets, wide receivers Marvin Jones and Golden Tate. 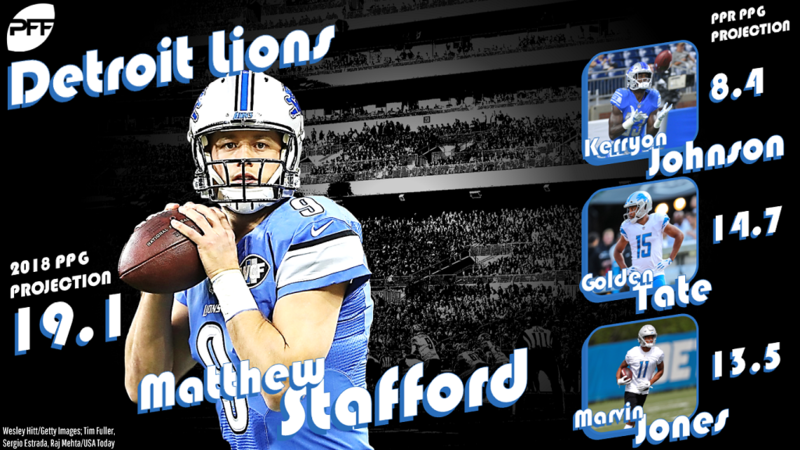 Since Cooter’s promotion to coordinator seven games into 2015, Stafford has completed 66.3 percent of his passes and averaged over 272 yards per contest. Best fantasy value: Matthew Stafford, QB — In six of the past seven seasons, the Lions QB has finished in the top 11 (QB6 in 2017) in per-game fantasy points, yet he still somehow popping up somewhere around pick 100 in fantasy drafts. Fantasy bust: All Lions’ tight ends — After cutting Eric Ebron loose, the Lions did very little to add at the position and have a trio of Luke Willson, Michael Roberts, and Levine Toilolo fighting for snaps and targets. Sleeper to watch: Theo Riddick, RB — Over the last three years Riddick has averaged 62 receptions and 504 receiving yards while catching 10 TDs and he should maintain his passing-down role in 2018. Rookie(s) to know: Kerryon Johnson, RB — Detroit traded up to land the workhorse out Auburn and figure to give Johnson every chance to take over the lead role, but how soon it happens remains to be seen. Best current player for their 2020 roster: Kenny Golladay, WR — Golladay got out of the gate fast as a rookie in 2017 before being slowed by a hamstring injury and faces a battle for targets in the season ahead, but with Tate (30) and Jones (28) aging he could be the team’s No. 1 option at wide receiver by 2020. The Packers’ offense fell apart last season once Aaron Rodgers went down and it had a trickle effect on the rest of the team’s fantasy assets. They moved on from wide receiver Jordy Nelson and replaced him with veteran tight end Jimmy Graham. 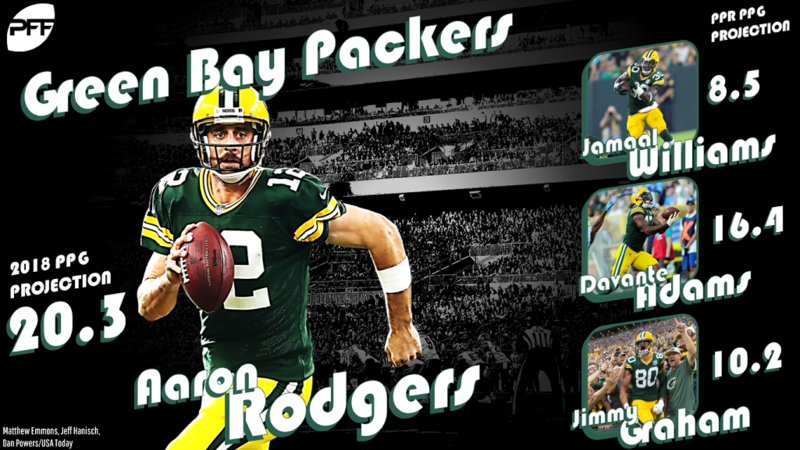 Rodgers is healthy entering 2018 and that should mean a return to fantasy relevance for every key player in Green Bay. Best fantasy value: Jamaal Williams, RB — The Packers appear to favor Williams as their lead running back entering the season after he flashed during the seven games he started, averaging over 96 total yards per game and scoring five touchdowns. Fantasy bust: Aaron Jones, RB — Jones is explosive and his talent tempts fantasy owners, but he’s suspended two games and could be buried on the depth chart when he returns. Sleeper to watch: Geronimo Allison, WR — Entering his third season, Allison appears poised to get a solid crack at significant snaps at wide receiver for the Packers entering the 2018 season. Rookie(s) to know: Marquez Valdes-Scantling, Equanimeous St. Brown, and J’Mon Moore, WRs — Green Bay has three rookies at wide receiver and any one of them could break out sooner rather than later, but owners in redraft leagues are advised to take a wait-and-see approach. Best current player for their 2020 roster: Davante Adams, WR — Adams is the only receiver in the league that has scored double-digit receiving touchdowns in two straight years and is still just 25 years old. The Vikings came up just short in their quest for a Super Bowl title, falling to Philadelphia in the NFC Championship game a year ago. The team responded by in inking free agent quarterback Kirk Cousins to a three-year, $84 million deal. His arrival and the healthy return of running back Dalvin Cook should lead to optimism. However, there are growing concerns up front as the offensive line has already been hit hard by injuries this summer. Best fantasy value: Kyle Rudolph, TE — Of the 99 passing touchdowns Cousins amassed in Washington, 27 of them had a tight end as the recipient and Rudolph (ADP 6.11/TE8) has made 15 trips to the end zone over the last two years. 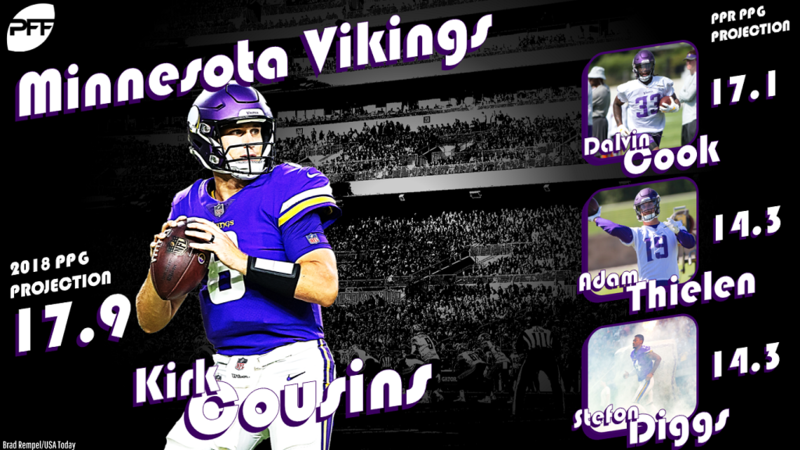 Fantasy bust: Kirk Cousins, QB — Expect his pass attempts to drop, perhaps significantly, with the Vikings’ defense being a much-better unit than the Redskins were and he likely will not be playing from behind as frequently. Sleeper to watch: Latavius Murray, RB — Murray is being drafted near the end of Round 12 despite his solid effort as the lead back last year, but he could surprise as the Vikings work to keep Cook fresh and even be used near the goal line. Rookie(s) to know: Daniel Carlson, K — Minnesota thought enough of Carlson to invest one of their two fifth-round picks on him and then they sent Kai Forbath packing midway through the preseason, handing the kicking duties over the rookie. Best current player for their 2020 roster: Dalvin Cook, RB — Cook just turned 23 this month and has the skill set to be a three-down back for years to come on a team that is built for the long term.